Sometimes, self-improvement books can be really frustrating. Often, they’re filled with bad advice or they just feel super impractical. However, every so often, I stumble upon a truly amazing one and then I just have to share. The most recent one I’ve been loving is: Aim True: Love Your Body, Eat Without Fear, Nourish Your Spirit, Discover True Balance! by Kathryn Budig. Like most females, I don’t always feel super positive about my body. 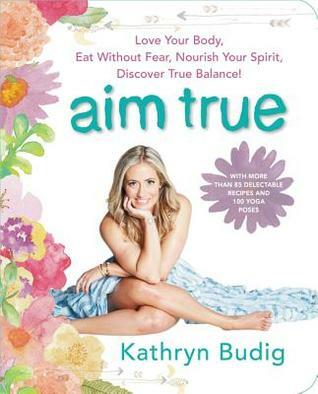 Well, in this book, renowned yoga instructor Kathryn Budig delivers solid advice for loving yourself inside and out. She also has a lot of anecdotes about her own experiences with body image, mental health, and physical health. Her writing style is light and humorous, and it almost felt like I was reading a very long letter from a new friend than reading a book. This book includes a lot: recipes, yoga guides, meditation guides, and self-care/homeopathy tips. But what I loved most was the personal, honest way that Budig shares her own journey. Even if you’re not in to yoga, I think this one is worth giving a try because it’s just so positive an uplifting. I highly recommend this book for all women, but especially those who sometimes struggle with their self-esteem and body image. Always nice to find truly empowering self help book.